The Qt resource system is a platform-independent mechanism for storing binary files in the application's executable. This is useful if your application always needs a certain set of files (icons, translation files, etc.) and you don't want to run the risk of losing the files. The resource system is based on tight cooperation between qmake, rcc (Qt's resource compiler), and QFile. It obsoletes Qt 3's qembed tool and the image collection mechanism. The resources associated with an application are specified in a .qrc file, an XML-based file format that lists files on the disk and optionally assigns them a resource name that the application must use to access the resource. 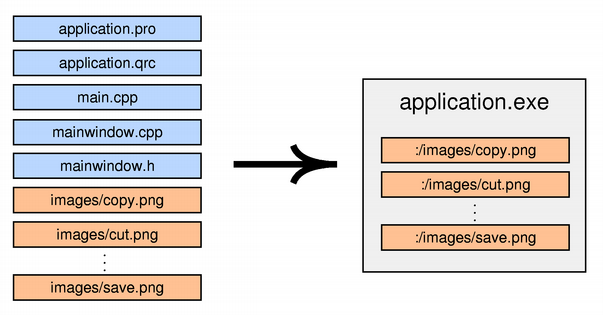 The resource files listed in the .qrc file are files that are part of the application's source tree. The specified paths are relative to the directory containing the .qrc file. Note that the listed resource files must be located in the same directory as the .qrc file, or one of its subdirectories. Resource data can either be compiled into the binary and thus accessed immediately in application code, or a binary resource can be created and at a later point in application code registered with the resource system. In this case, the file is accessible as :/myresources/cut-img.png. If the user's locale is French (i.e., QLocale::system().name() returns "fr_FR"), :/cut.jpg becomes a reference to the cut_fr.jpg image. For other locales, cut.jpg is used. See the QLocale documentation for a description of the format to use for locale strings. For an external binary resource to be created you must create the resource data (commonly given the .rcc extension) by passing the -binary switch to rcc. Once the binary resource is created you can register the resource with the QResource API. qmake will produce make rules to generate a file called qrc_application.cpp that is linked into the application. This file contains all the data for the images and other resources as static C++ arrays of compressed binary data. The qrc_application.cpp file is automatically regenerated whenever the .qrc file changes or one of the files that it refers to changes. If you don't use .pro files, you can either invoke rcc manually or add build rules to your build system. Currently, Qt always stores the data directly in the executable, even on Windows and Mac OS X, where the operating system provides native support for resources. This might change in a future Qt release. See the Application example for an actual application that uses Qt's resource system to store its icons. Qt's resources support the concept of a search path list. If you then refer to a resource with : instead of :/ as the prefix, the resource will be looked up using the search path list. The search path list is empty at startup; call QDir::addResourceSearchPath() to add paths to it. Similarly, if you must unload a set of resources explicitly (because a plugin is being unloaded or the resources are not valid any longer), you can force removal of your resources by calling Q_CLEANUP_RESOURCE() with the same base name as above.